Nautilus 2017 Field Schedule Map. Image courtesy of the Ocean Exploration Trust. Download image (jpg, 56 KB). 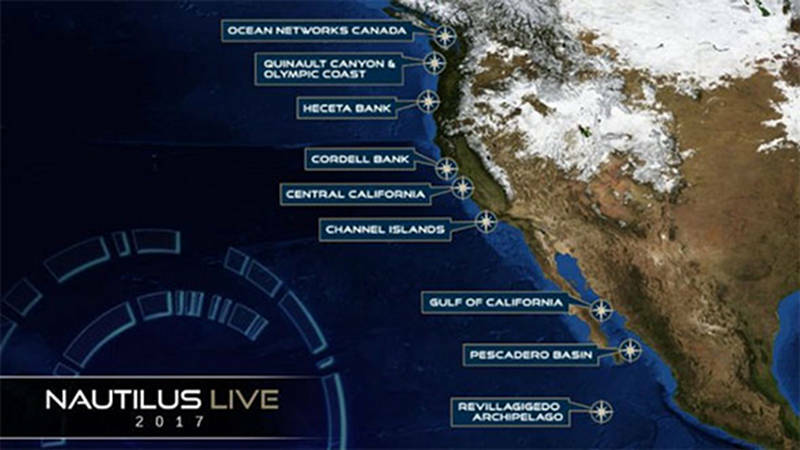 On May 5, 2017, the Ocean Exploration Trust will launch the third year of exploration in the Eastern Pacific Ocean on Exploration Vessel (E/V) Nautilus. From May to November, scientists will document and survey unexplored regions from British Columbia, Canada, along the West Coast of the United States, to Baja California, Mexico. Using a multibeam sonar and sub-bottom echosounder, E/V Nautilus collected high-resolution bathymetric, surface sediment characteristic, subsurface geology, and water column data between San Pedro, California, and the Pacific Northwest, focusing on areas within the U.S. Exclusive Economic Zone (EEZ). These types of seafloor mapping data are useful for identifying areas or features of interest, creating bathymetric charts for remotely operated vehicle (ROV) dive planning and situational awareness, and locating hydrothermal vents and gas or oil seeps. 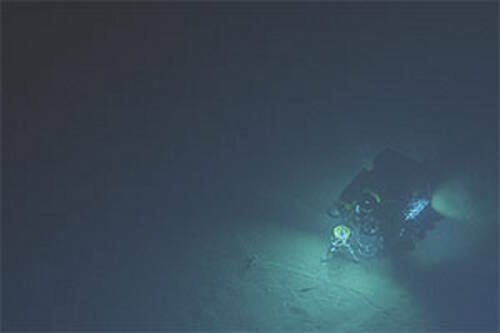 Remotely operated vehicle Hercules works on the seafloor. Image courtesy of the Ocean Exploration Trust/Ocean Networks Canada. Download image (jpg, 7 KB). For much of June, Nautilus explored Canadian waters with Ocean Networks Canada (ONC). 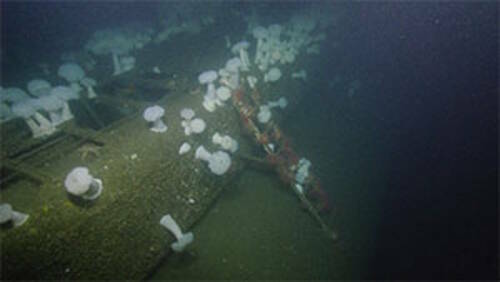 ONC operates cabled ocean observatories that supply continuous power and Internet connectivity to a broad suite of subsea instruments. The ONC NEPTUNE observatory installation, off Vancouver Island’s west coast, spans one of the widest ranges of ocean environments found anywhere in the world. Nautilus provided maintenance and support of the 500-kilometer loop of fiber optic cable that connects nodes along the observatory, deployed and recovered various observatory sensors and instruments, and conducted seafloor mapping surveys and ROV surveys and sampling. View photos of the installation of research instruments at Clayoquot Slope and photos of some of the Ocean Networks Canada instruments . During this expedition, scientists used the multibeam sonar and sub-bottom echosounder on the E/V Nautilus to map the seafloor, targeting areas within the U.S. EEZ between San Pedro, California, and the Pacific Northwest. 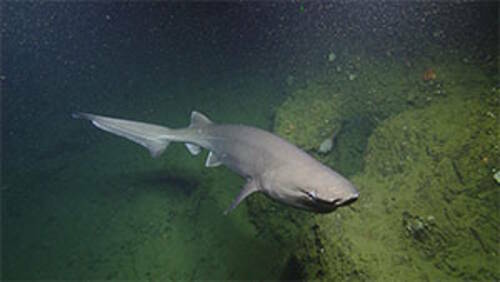 As its name suggests, this bluntnose sixgill shark has a characteristically blunt rounded snout and six gill slits on either side of its head, instead of the usual five seen in most shark species. One of many sharks seen while exploring submerged shorelines around the Channel Islands. Image courtesy of the Ocean Exploration Trust. Download image (jpg, 15 KB). During this expedition, scientists explored Channel Islands National Marine Sanctuary, located off the coast of Santa Barbara and Ventura counties in California. Less than 50 percent of the seafloor within the Sanctuary’s boundaries had been mapped by high-resolution sonar, and the 2016 Nautilus expedition to the same region worked to cut this knowledge gap nearly in half. The 2017 expedition continued this exploration by using a high-resolution mapping system to collect sonar bathymetry and sub-bottom profiling data to characterize the seafloor in these unmapped areas. Following mapping operations, the Nautilus team used ROVs to conduct visual surveys, collect high-definition video imagery, collect biological and geological samples, and ground truth newly collected multibeam data. This cruise was part of a larger initiative to understand sea level history and locate, map, and document submerged paleo-shorelines in the Channel Islands region. View photos of other sharks, skates, and relatives like ghost sharks and photos of a whale fall , all encountered during this mission. ROV Hercules grabs a carbonate rock sample from this habitat. Scientists study the chemical composition and microbial inhabitants of these rocks to provide important clues about fluid flow at seeps. Image courtesy of the Ocean Exploration Trust. Download image (jpg, 27 KB). During this expedition, E/V Nautilus moved north along Central California’s shoreline, to explore numerous submarine canyons that cross-cut the continental slope and support biological communities such as deep-sea corals. Scientists explored and sampled unusual and novel features, fauna, sediments and authigenic rocks, to expand our knowledge of the canyons off Central California. The diversity of habitats found in the area also presented an opportunity to study the critical role that microbes play in supporting animal communities and influencing ocean chemistry. This expedition also included launching and testing a new deep-sea microbial and chemical sensor and sampler to study microbial processes in low-oxygen environments. View images of tools used to sample methane seeps during the expedition. The garden-like coral and sponge habitats of the canyon walls in Cordell Bank National Marine Sanctuary lent themselves well to octopus and squid sightings. Image courtesy of the Ocean Exploration Trust. Download image (jpg, 26 KB). E/V Nautilus transited north along the California coast to Cordell Bank National Marine Sanctuary, offshore the San Francisco Bay Area. Scientists visually surveyed deepwater habitat within the Sanctuary that had never been explored and characterize habitat, species, and communities found in these waters. The main objectives of this expedition included collecting high-resolution multibeam sonar data to identify hard substrate areas, using ROVs to complete initial surveys of newly protected areas of the Sanctuary, and collecting biological specimens and environmental data. This data collection will help the Sanctuary to characterize habitats and document distribution and abundance of deepwater corals, sponges, and fishes. This information will help inform marine resource management, policy decisions, and new research. 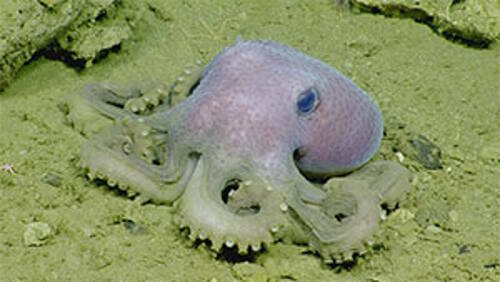 View additional images of octopods and squids and images of ROV sampling techniques from the expedition. Diving off Cape Flattery, Washington in Olympic Coast National Marine Sanctuary, E/V Nautilus conducted the first detailed archaeological survey of USS Bugara on August 25, 2017. This image shows the ladder from the ship. Image courtesy of the Ocean Exploration Trust. Download image (jpg, 13 KB). Returning to the Pacific Northwest, Nautilus launched an expedition in Olympic Coast National Marine Sanctuary. Though mapping efforts have helped to characterize seafloor substrates in some portions of the Sanctuary, only very small portions of the Sanctuary have been visited or photographed. Quinault and Quileute Canyons have never been explored by ROV or autonomous underwater vehicles (AUVs). Expedition objectives included exploring and characterizing seafloor resources and features of the Olympic Coast National Marine Sanctuary that are associated with three prominent submarine canyons: Quinault Canyon, Quileute Canyon, and Juan de Fuca Canyon. Resources explored through AUV and ROV deployment included biogenic, habitat-forming (deep-sea coral and sponge) benthic communities and associated species and possibly methane seeps. This expedition also included visiting and documenting the wreck of submarine USS Bugara, a maritime heritage site, and conducting multibeam mapping of various priority areas. View additional images of the USS Bugara as well as images of deep-sea corals seen while exploring Quinault Canyon. 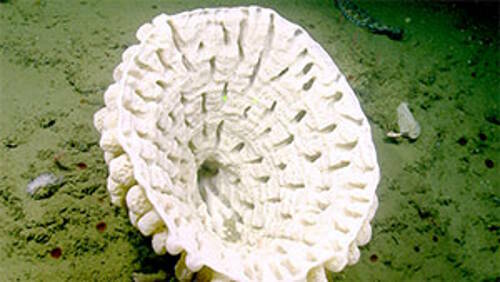 This Chalice sponge (Heterochone calyx) is very large. 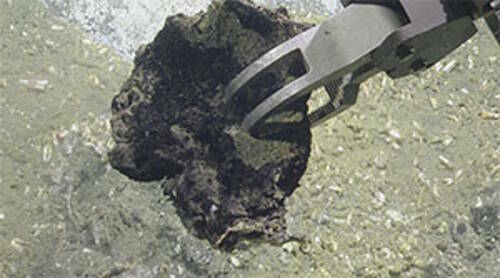 Sponges are slow growing, so given its size, this sponge may be very old. Image courtesy of the Ocean Exploration Trust. Download image (jpg, 28 KB). Returning south along the coast of Oregon, scientists conducted geophysical surveys near Heceta Bank in order to search for late Pleistocene-aged remnant landforms and possible archaeological sites. Offshore research activities occurred in two study areas positioned along Oregon’s central coast, including the lower reach of the ancient Umpqua River–one of Oregon’s largest coastal drainages. Geophysical surveys were used to inform the collection of further baseline multibeam sonar and sub-bottom data and digital imagery to determine when and how Oregon’s past coastal environment evolved toward its modern form and to search for evidence of the first North Americans. View additional images of sponges seen during the expedition. During this expedition the E/V Nautilus’ multibeam sonar and sub-bottom echosounder was used to collect bathymetric, surface sediment characteristic, subsurface geology, and water column data between the Pacific Northwest and San Pedro, California, focusing on areas within the U.S. EEZ. Moving south along the Baja California Peninsula, Nautilus continued multibeam mapping operations in three areas to facilitate later explorations in the Revillagigedo Archipelago. The largest and highest priority area for exploration encompassed the island of Socorro and extends southwards along the Mathematician Ridge. The second and third areas encompassed the islands of San Benedicto and Roca Partida, extending down their submarine slopes. The submarine parts of these islands remain largely unexplored despite the occurrence of active volcanism and their importance as gathering and breeding places for large pelagic fish, reptiles, and marine mammals, such as humpback whales, that migrate along the U.S. west coast. Multibeam mapping data are critical to the assessment of habitat characteristics over a wide range of water depths and are essential for the management and preservation of this unique marine environment and newly designated UNESCO World Heritage Site. Tube worms, such as this grouping of Riftia seen in the North Guaymas Basin of the Gulf of California, host a bacterial symbiont, which allow them to utilize the chemicals seeping out in cracks within the seafloor. Image courtesy of the Ocean Exploration Trust. Download image (jpg, 33 KB). Moving closer to shore, Nautilus explored the Gulf of California (GOC), an area fed by nutrient-rich waters, making it extremely biologically productive. The GOC is also an area of active seafloor spreading directly linked to the San Andreas Fault System. A multidisciplinary study of the GOC will provide information on the dynamic environment of a young, diverse, and evolving ocean basin. Particular areas of interest for this Nautilus expedition included the interaction between hydrothermal fluids, organic-rich sediments, and magma, and their impact on seafloor biological communities at a prominent spreading center in the Guaymas Basin. The Nautilus team used ROVs, specialized instruments, and acoustic mapping systems to explore new vent study sites; collected biological, mineralogical, and geological samples; and collected high-resolution video. 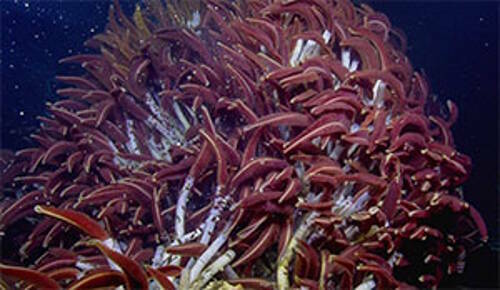 View additional images of hydrothermal vent communities seen during the expedition. The main objective of this expedition will be to conduct an integrated biogeochemical exploration of the Pescadero Basin vents in the Gulf of California. The Nautilus team will measure and collect vent fluid, rocks, sediment, and biological samples to work to answer key questions about geologic processes, biogeochemistry, and biogeography in the unique geological context of Pescadero Basin. In 2015, the deepest high-temperature hydrothermal vents in the Pacific Ocean were discovered in the basin. Initial observations revealed enigmatic aspects of this vent system, including unique mineralogical composition and fluid geochemistry, suggesting that there is much to be learned about deep-ocean carbon dynamics in this system. During this expedition, Nautilus will return for deeper exploration of the Revillagigedo Archipelago, consisting of the islands of Socorro, Clarion, San Benedicto, Roca Partida and numerous associated seamounts. The work will focus on unusual styles of shallow-water volcanism and searching for hydrothermal activity using new laser-based imaging technology, ROVs to characterize benthic biological communities, and ROV-deployed sensors and an ultra-low-light bioluminescence camera to collect baseline water column data. The new data will shed light on both the deep and shallow geologic structure of seamounts, providing insights into unusual processes of shallow-water volcanism and how these volcanoes contribute to seamount evolution, volcanic hazards, impacts on biological communities, and potential economic mineralizations. These types of baseline data are also critical to the assessment of species diversity and habitat characteristics over a wide range of water depths and are essential for the management and preservation of this unique marine environment and newly designated UNESCO World Heritage Site.